So what is the McSherrystown Moose fraternity all about? It's a private, non-denominational organization of people helping people, with a special focus on serving our communities and caring for children and senior citizens. 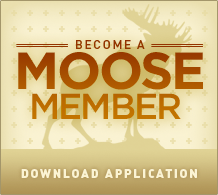 The Moose Lodge and Family Center provides affordable activities for members and their families. From sporting events and family dinners, to holiday parties, children events, and everyday social activities, the McSherrystown Moose Lodge provides a sense of camaraderie and fellowship which can only be defined as second to none. - chicken or beef $1.00 ea. . . . . . . . . . . . . *Lunch Specials are served all day while supplies last.